Editors' note: Jordan is a pediatric SLP, so kids are the focus of her post. However we think the Popplet app and strategies Jordan describes so well could work for all ages. I want to share my review of a fantastic app that I've been successfully experimenting with in my social cognition work with kids. Popplet was designed to create visual maps, presentations, and brainstorms across environments such as work and school. It would make a great visual mapping tool for kids who are gathering information for a class research project, for example. I recommend you take a look at the examples provided by the developer, because the sky is the limit as far as ways to use this app. So far, I have used the Popplet app in a couple of really fun ways. First, I found it to be a simple means to create a way to store information about other people that we can open up and refer to when we want to make conversation with them on topics they are interested in. For many kids with social language challenges, this is an effective strategy. In a recent social group, four school aged boys were having difficulty finding common ground in their interests as they were negotiating what to play. My colleague and I were hearing seemingly endless discussion that sounded like this: "Let's be Angry Birds!" "No! I want to do Superheroes!" "No...I'm not really into Superheroes..." "Well I don't even know what Angry Birds IS!" "I don't watch TV at all but I play games on my computer..." I realized that they needed to find common ground, and so I pulled up Popplet on my iPad and we sat together and had a very effective and focused conversation about what each of them likes. Using the lines connecting pictures, I was able to show them visually where their mutual interests or connections were. In the actual Popplet we used, I included a photo of each boy but for the sake of privacy I have taken out their photos and titled them "Boy 1" and so on. We discovered that Phineas and Ferb was the one thing they all seemed to share as a common interest, and so I outlined that picture in a different color border and made it slightly larger to highlight it for them. 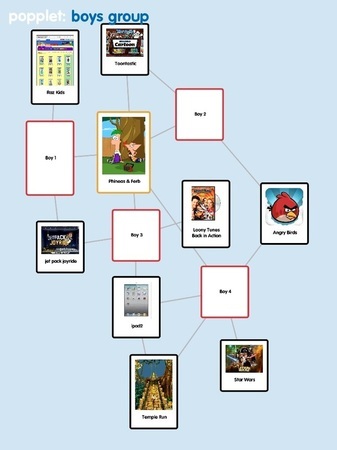 We were able to print the Popplet and also email it home for the boys to think about during the week; it's a great visual to pull out in group now when they are struggling to figure out what kind of games they want to play. This week I came up with another fun use. My OT colleague and I were running a social group with three preschool aged girls who wanted to draw. They began to ask us to draw different faces for them, showing various emotions, and because we are therapists who focus on social emotional learning, we spent time talking about how all the parts of our faces change as our feelings change. It can be helpfu for children to learn to interpret facial expressions as a window into someone's emotional state and to learn to show others how they feel by changing their own faces. Therefore we talked about things such as, "If this is an angry face, it will have an angry mouth and even angry eyebrows!" They were fascinated with this. We then decided to let them see these expressions on their own faces. Each girl had a wonderful time recording a range of her own early emotional expressions using the camera on my iPad Mini (perfect for small hands!). With the camera lens reversed, the girls could keep adjusting their expressions as if they were looking into the mirror until it matched the feeling they wanted to portray, and then we'd take the picture. We flipped through the pictures and had the rest of the group guess each of our emotions based on a study of the expressions. This was fun for all of us, and we observed an immediate improvement in social cognition when one girl cried about leaving and one four-year old peer said, "She's sad...I see her sad mouth and her sad eyebrows." I opened up the Popplet app and very quickly made each girl a Popplet such as my example below. I emailed them to their parents to look at and play with at home for generalization. Popplet is very simple to learn and use quickly, making it a terrific app to use when working with children. The user can print the Popplet and save it to the camera roll of an iPad or iPhone as a .jpeg. It is also easy to email as a PDF or a .jpeg. You can try it out for free by downloading Popplet Lite from the App Store, but the lite version only allows you to make a single Popplet. I bought the $4.99 version within about ten minutes. I'd love to hear how you use Popplet! A version of this post was published at www.JordanSadler.net. Have You Seen Flummox and Friends Yet?